Sound Healing is a fast-growing modality used to alleviate many stress-related conditions (such as anxiety, insomnia, and high blood pressure to name only a few). As stress is a major cause for suffering and disease, sound is rapidly becoming known as a very versatile and powerful healing medium. Using sound for therapy and healing has been shown to relax our nervous system, improve our state of mind and improve the function of our immune system. It helps with sleep and pain relief, brings us in tune with ourselves, and uplifts our vibration and state of being. As we are essentially vibration and are impacted by our environment, we are exposed to unnatural and disharmonious vibrations every day. Be it traffic noise, building sites, computers, air conditioners or mobile phones and wifi, they all impact our vibration and build stress in our bodies. The principle of entrainment is one of the main components in the sound healing process. The idea is that if you project a steady, harmonious sound at a disharmonious one, it will eventually bring it into resonance with the harmonious sound. Our atoms, molecules, cells, glands, and organs all have a natural resonant frequency that can get ‘out of tune’. Applying the correct frequency outside our body can stimulate sympathetic vibration inside and bring you back in tune. Music helps me share what I cannot express with words. During my travels, my love affair with music grew and I spent endless nights playing and singing my heart out – eventually performing and touring internationally. This taught me that music is a universal language that can bridge cultural divides and bring people together in harmony, unity and open hearts. In 1990, I started exploring different aspects of sound and its uses for physical & emotional transformation and healing. I now facilitate group and individual sound healing sessions – applying different techniques of voice work and vibrational therapy to help inspire, alleviate pain, stress and anxiety, and give people support on their healing journey. Through the years I have worked with people with cancer, various addictions, anxiety and stress-related conditions. 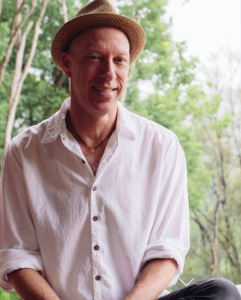 I currently live in the lush Byron Bay hinterland where I also record and produce the work of other artists – helping them bring their music to life! I also perform with my band Hamsa at private events around Australia.